Marjoram is an herb that can be identified by its smooth, oblong leaves that look very similar to oregano. In fact, it is often called “sweet marjoram” to differentiate it from oregano, which is sometimes known as wild marjoram. Though the two are closely related, sweet marjoram is not as spicy as oregano and it has a distinctive sweet pine and citrus flavor. Store fresh marjoram in the refrigerator, loosely wrapped in a damp paper towel and slipped into an airtight container. 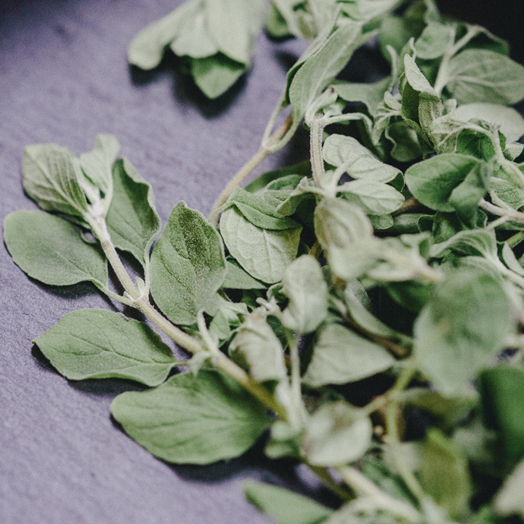 Marjoram leaves dry quickly and maintain their distinct flavor. To dry, hang a small bunch of marjoram stems upside down in a dark, ventilated area. Once dry, crush the leaves, toss out the stems and store in an airtight container. Marjoram is a cold-sensitive perennial herb, but talented farmers and gardeners can harvest it nearly year round.